Imagine yourself floating along one of Europe’s great rivers, a hundred feet from shore where quaint houses dot the landscape. When your ship docks, you are in the midst of cobblestoned streets in storied towns, not miles away in a port filled with freighters. During a recent holiday season, Uniworld’s River Countess docked at picturesque Wertheim, Germany, and I stepped off it into a centuries-old town known for its blown-glass Christmas ornaments and Franconian wine. Ship to the heart of town was a five-minute walk in dry, crisp air filled with tantalizing aromas. Around me were stone buildings, half-timbered houses and an 800-year-old castle. You, too, have seen Wertheim, in fairytales. When I returned to the ship, a crewmember stood in the doorway, greeting passengers with cups of hot glühwein. Nearby, a tray of chocolate-covered gingerbread confections called to me … I didn’t resist. This past May, I cruised the Seine on the Avalon Creativity, taking a Paris-Normandy-Paris itinerary. Leaving Paris, I watched the city shrink as I leaned out my patio door. As the ship passed through the first lock, city life gave way to the country, and estate homes and remnants of Roman bridges came into focus. Along quays local people biked or strolled, and along the banks, the first of many duck families I would see glided by. Never until that river cruise had I witnessed a mother duck gently clasping her young under her wing. River cruising is unique among touring styles in that the ship is not only small enough to dock at town centers, it is also more intimate. Passengers often begin calling one another by name the first night aboard, and you become immersed in the culture of the destination even before setting food on land. When I see local life unfolding as I float along the waterway, I learn something about the people. River cruising also has many value-added attributes. Shore excursions, which can be quite expensive on ocean cruises, are included at no extra charge. Tours are escorted by local guides and, seasonally, take advantage of special events such as tulip-time or European holiday markets. Mature adults — couples, friends, solo travelers –are particularly suited to river cruising. The average age of river-cruise passengers is 45-55 years old, and the majority are experienced travelers. Particularly attractive to me, a woman whose road-warrior husband prefers to vacation in his own home, is the mix of passengers, women traveling solo or with friends, as well as couples. I never feel like a third wheel when I’m on a river cruise. While large ships have a wide range of price points and ages, a small ship tends to have more compatibility of interests and budgets because, usually, there are but three or four decks. Every cabin is an outside cabin, and everyone eats together in the same dining room, served from the same menu. Although it’s a fast-growing niche market, river cruising isn’t for everyone. If your travel preferences include limbo on the deck and floorshows, you’ll probably be more satisfied with an ocean cruise. If, however, you find congenial conversation stimulating, history inspiring and local culture enriching, you’ll likely take to river cruising as I have. I fell in love with river cruising long before I became a travel consultant, and come November I’ll be cruising the Danube. Ever since my first river cruise, when I stepped off the ship into the heart of a European city, I’ve found myself stepping into history. On an early morning in Rouen, for example, I crossed the street into the city’s historical soul and marked the spot where Joan of Arc was burned. Another time, on the beaches of Normandy, I stood on the sand where Allied troops stormed the beaches on D-Day. I’ve also enjoyed less-historical pursuits, of course, such as snacking on Nuremberg’s famed mini-sausages right where they were grilled, sampling locally brewed liqueurs from the cask in Heidelberg and, while docked in Paris, walking to Monoprix, and back, to shop for gifts. I remember my Paris cruise well. My last night there aboard the Creativity, I watched the sparkling Eiffel Tower blink in a dazzling display of light, while planning my next river cruise … the one after the November cruise … the one still in my imagination. River cruise lines ply the great rivers of Europe, China and Egypt. From the Danube discoveries of Hungary and Austria, to the Seine, Saone, Rhone, Rhine, Main and Moselle Rivers of Western Europe, itineraries have been developed to satisfy travelers who appreciate vineyards, architecture, UNESCO heritage sites, history and unique shopping experiences. Paris leads cruisers to Normandy or to the Cote d’ Azur; Danube cruises visit Budapest, Vienna, Melk and Passau. 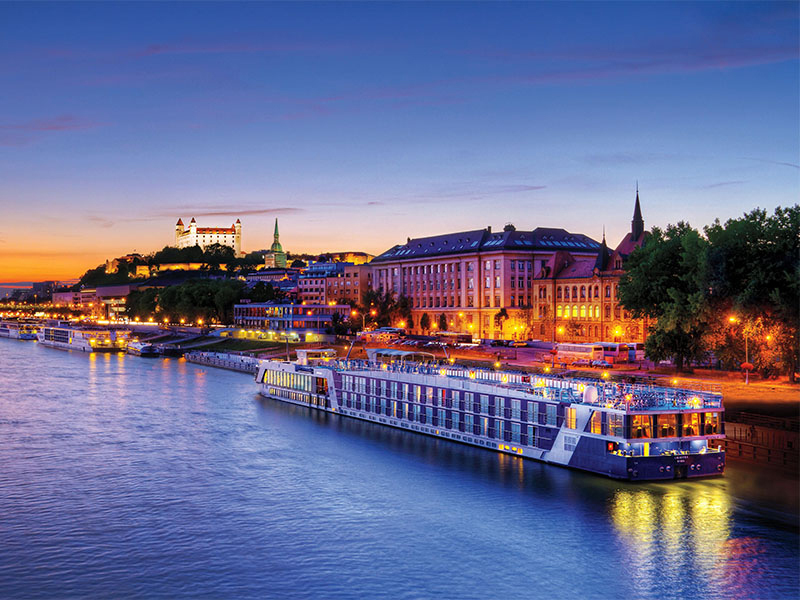 The dominant river cruising companies – Uniworld, Viking, Avalon Waterways, AMA Waterways, and Tauck – are putting new ships in worldwide river waters every year. The ships are intimate, like-minded communities holding less than 150 passengers. Meals are open seating and, typically, wine is offered with dinner. In the evenings, there’s always something going on in the lounge.